Elvis recorded his first version of this number together with "My Happiness" as a private recording — his very first recording, in fact, in the summer of 1953 (and, no, it wasn't a present for his mother's birthday) It was also included in the jam session that took place at the Sun Studios, Memphis, in December 1956, known to the world as "The Million Dollar Quartet." This might have made Elvis think of the song again enough to include it in his next studio session for RCA, which took place at Radio Recorders in Hollywood. Shep Fields was born in 1910 in Brooklyn, New York. He played saxophone and formed his own band, broadcasting on NBC. 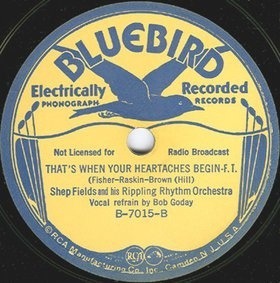 He would open his shows with a "rippling" sound that he produced by blowing through a straw, the end of which was submerged in a bowl of water and this can also be heard on his original version of "That's When Your Heartaches Begin," which was recorded on 3 June 1937, with lead vocal by Bob Goday. It was released on Bluebird B-7015 as the B-side to "The Merry-Go-Round Broke Down," perhaps better known nowadays as the theme tune for Looney Tunes. Shep Fields died in 1981.